India Steele is desperate. Her father is dead, her fiancé took her inheritance, and no one will employ her, despite years working for her watchmaker father. Indeed, the other London watchmakers seem frightened of her. Alone, poor, and at the end of her tether, India takes employment with the only person who’ll accept her – an enigmatic and mysterious man from America. A man who possesses a strange watch that rejuvenates him when he’s ill. Matthew Glass must find a particular watchmaker, but he won’t tell India why any old one won’t do. Nor will he tell her what he does back home, and how he can afford to stay in a house in one of London’s best streets. So when she reads about an American outlaw known as the Dark Rider arriving in England, she suspects Mr. Glass is the fugitive. When danger comes to their door, she’s certain of it. But if she notifies the authorities, she’ll find herself unemployed and homeless again – and she will have betrayed the man who saved her life. 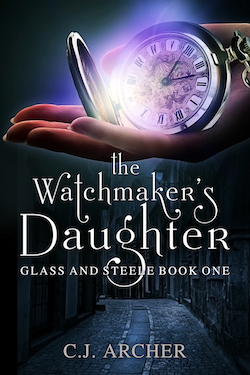 With a cast of quirky characters, an intriguing mystery, and a dash of romance, THE WATCHMAKER’S DAUGHTER is the start of a thrilling new historical fantasy series from the author of the bestselling Ministry of Curiosities, Freak House, and Emily Chambers Spirit Medium books. I honestly wasn’t sure what I thought this book was going to be like, but it was far better than I had anticipated. I absolutely adore the depth that Ms. Archer puts into her characters, their backstories, their desires. While it is often plot that drives a story, the deep characterization is what makes the reader truly feel for this heroine, who is far more outspoken and forward than most women (especially those looking for a husband) would be in that time period, which makes her all the more intriguing. I love the relationships between characters, and the so obvious tension that no one is willing to push pass to address. I absolutely love how important clocks are, and I had almost thought we were going to end up with a steampunk vibe, but although there is a bit of connection it is not enough to consider this novel that genre. While there might be something supernatural going on, the events are expertly entwined with coincidences and knowledge that the heroine would have that it isn’t obvious. Though Ministry of Curiosities is still my favourite of her series, this is my second so far. India is a very strong female lead, someone that I found myself wanting to rally behind and see accomplish great things, and find happiness in life, even if she thinks she’s “spinster age”. If you have the chance, I highly recommend this book. C.J. Archer has loved history and books for as long as she can remember and feels fortunate that she found a way to combine the two. She has at various times worked as a librarian, IT support person and technical writer but in her heart has always been a fiction writer. 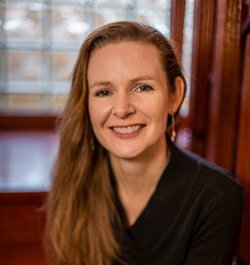 While she has written historical romance in the past, she now writes exclusively in the historical fantasy genre (with a large dose of romance). She has several series which occur in the same Victorian-era “world”, one after the other. Each series can be read alone, but it’s more fun to start at the beginning with THE EMILY CHAMBERS SPIRIT MEDIUM TRILOGY. Follow that up with all 9 FREAK HOUSE books, then the MINISTRY OF CURIOSITIES series. GLASS AND STEELE, her newest series, is set in an entirely different alternate Victorian London.